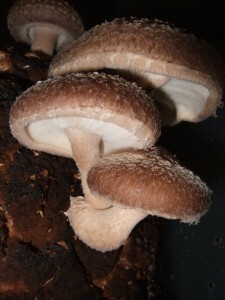 A Shiitake mushroom ( Lentinula edodes) refers to an edible fungus that usually grows in forests. It is the second most cultivated and harvested edible mushroom across the globe. Sometimes, the extract of this mushroom or the entire dried mushroom are used for herbal remedies. When used for studies in animals, it possessed cholesterol-lowering, virus-inhibiting, and antitumor properties. For this reason, it is reasonable to conclude that shiitake mushrooms are a great addition to a balanced diet. Since shiitake mushrooms originated from China, it has become a common ingredient in Chinese cuisine. They are extremely popular in Asian countries, but are also used for different dishes around the world. A shiitake mushroom can effectively lower cholesterol levels in the body due to its powerful compounds known as eritadenine. Another scientific study in Japan also showed the regular consumption of this mushroom allows the body to get rid of cholesterol through defecation. Shiitake mushrooms contain another powerful compound, lentinan, which strengthens the immune system and helps it fight against infections and diseases more effectively. They can also protect the body from common infections such as influenza and more serious health issues like HIV. Regular consumption of shiitake mushroom can also prevent cancer by inhibiting the growth of cancer cells and stopping existing ones from spreading. It can also stimulate the immune system to produce proteins that can kill cancer cells, especially those that cause gastric cancer. These edible mushroom spores can also prevent thrombosis, a health condition that may cause blood clots in your veins, thus leading to restricted blood flow. People who have experienced sitting down for long periods of time without any activity, may have already experienced this condition. It usually affects the veins of the legs and can result in varying intensities of leg pain. A shiitake mushroom is also rich in iron, a mineral that is critical to maintaining good health and improving the circulation of oxygen in the blood. Since shiitake mushrooms are rich in iron, it can also make sure that nutrients and oxygen are effectively delivered to your brain, muscle cells, and other vital parts of your body. They are also ideal for curing anemia, boosting energy levels, and delaying the onset of fatigue. If you are trying to lose weight, these mushrooms are great for dieting because they contain a very small amount of calories. They also contain plenty of dietary fibers, which can slow down digestion and make you feel full for longer. A shiitake mushroom is ideal for fighting the progression of AIDS and cancer because it can enhance the immune system. It is also known for preventing hypertension, heart disease, and other degenerative illnesses. Studies have also revealed that shiitake mushrooms can cure infections such as hepatitis by producing a group of natural protein known as interferon, which stops viruses from multiplying. Those who promote the use of these mushrooms also suggest that eating both their stem and cap may be useful. However, their effectiveness and strength greatly depends on how they are prepared and consumed. Those who support the use of shiitake mushroom also claim that it contains several compounds with individual health benefits. For example, a compound known as lentinan can delay or prevent the growth of tumors altogether. It also contains activated polysaccharide compounds known as 1.3-beta glucan that can reduce the activity of tumors and lessen the unpleasant side effects of chemotherapy. It also contains a compound known as eritadenine, which can lower cholesterol by blocking it and preventing it from being absorbed into the bloodstream. Clinical studies and research support these claims. While dried or fresh whole mushrooms are widely available in grocery stores and mushroom farms, various health food stores sell its extracts in capsule form. Complete kits for growing mushrooms at home are also available from some online sellers. For medicinal purposes, its extract is usually recommended rather than the use of the mushroom itself. Japanese researchers also recommend Shiitake extract to patients undergoing chemotherapy for nose, throat, stomach, and lung cancer. Its activated polysaccharide compound is sold as a nutritional supplement in Europe, Japan, and the United States. Medicinal use of shiitake mushroom dates back to 100 AD in China. It has been widely consumed as food for thousands of years in eastern countries. Today, shiitake mushrooms have also become popular in the United States. Studies in humans also show that lentinan can prolong the life of patients who are suffering from colorectal or stomach cancer. This beta glucan can stimulate the immune system by activating specific proteins and cells that can attack cancer and slow down its growth. Several studies regarding the cancer-fighting substances of shiitake mushroom also show that its purified form is ideal for curing colorectal and stomach cancer. A non-randomized study in 2002 observed the use of mushroom extract by men who are suffering from prostate cancer, but no beneficial effect was found. More clinical trials that involve humans are needed, to determine what compounds in shiitake mushrooms are effective for curing specific types of cancer. To reduce the risk of cancer, it is necessary to eat a healthy diet that contains servings of whole grains, fruits, vegetables, and small servings of red meat. Does Shiitake mushroom have any side effects? In general, whole shiitake mushrooms as well as their extracts are safe to use. However, some reports suggest that bloating or diarrhea may occur with the over-consumption of shiitake mushroom. It is also sold as dietary supplements in different countries, but their effectiveness when used with other medicines and supplements are still unknown. The limited scientific studies regarding the side effects of consuming this edible mushroom also makes it difficult to decide if it is completely safe to use. Although shiitake mushroom is great for fighting cancer and other diseases, relying on it alone and avoiding conventional medical care may result in serious health problems.